← How to set paper size to PDF file when convert PCL file to PDF file with -raster option? 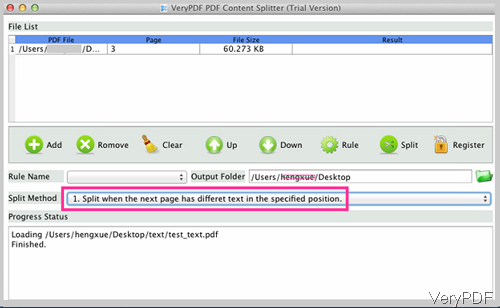 In this article, I will show you how to split PDF according to text position in PDF under Mac system. This function is extremely good when you need to split PDF at any position of the PDF page. 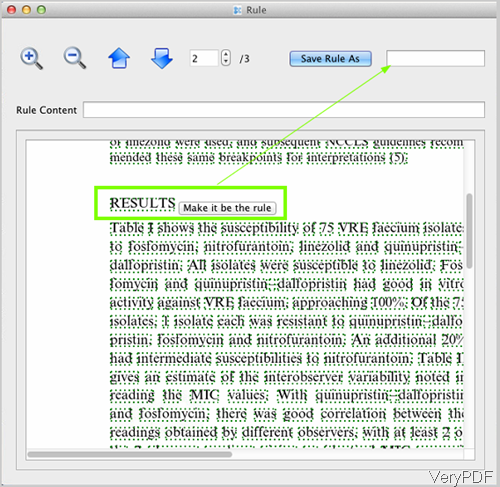 Different with other PDF splitting software, it splits PDF according to text content not according to the PDF page. The software I use is named as VeryPDF PDF Content Splitter for Mac, which also has Window version and allows you to split PDF according to position under Window system. If you need to know more information, please visit homepage. In the following part, let us check how to use this software. This software is GUI version, so you need to install this software. Before pay for it, you can evaluate it more than 20 times totally free. When downloading finishes, there will be a .pkg file. Please install this software by double clicking the .pkg file and following installation message. When installation finishes, please go to Finder then Application, you can launch this software. The following snapshot is from the software interface, please have a check. Step 2. 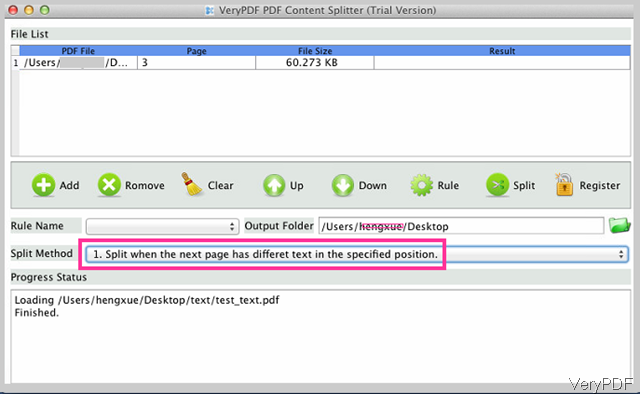 Split PDF according to some word position under Mac system. When you launch software, please click button Add to add PDF file to software interface. This software supports all version PDF file and when you do batch splitting, there is no adding files number limited. Added PDF will be shown in the list with file path and file size. Choose the output folder by clicking folder icon on the software interface. Choose splitting method:split PDF pages containing different text in given position, to separate PDF files, split two continuous pages having different text in the position to two PDF files and others. Then click button Rule to set splitting word and its position. The following snapshot is from the rule setting menu option, please have a check. When you enter it, PDF content will be shown here. Simply choose the word and its position by clicking the word and then there sill be button showing up like I showed in above snapshot. Click Make it be the rule, then the words will be shown in Rule Content. Please name it at Save rule as. By this way, next time you can use this rule directly from the software interface. Then you can back to the main interface, click button Split to run the splitting process at once. A few seconds later, you can check the split PDF files in output folder. By this software, we can split PDF according to text position no matter the text content same or not under Mac system. During the using, if you have any question, please contact us as soon as possible. How to stitch PDF under Mac system? This entry was posted in Software for Mac and tagged split PDF. Bookmark the permalink.